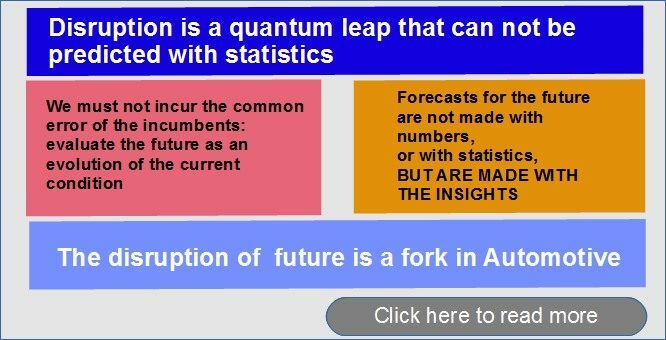 Disruption is a quantum leap that can not be predicted with statistics. We must not incur the common error of the incumbents: evaluate the future as an evolution of the current condition, since the “History” carries out leap that send upstream the predictions of those who make a “linear” analysis of the evolution of Society and Market. that derive from a careful “analysis” of trends (a perceptual, non-numerical analysis). Understanding in what direction disruptive innovation can go is not easy for those based on “institutional” culture. and therefore has the intuition of a Visionary (capacity that the Managers of incumbents, who in currente Market have replaced the Entrepreneurs, do not have). ► CITY VEHICLES, which will be completely different from the current City Car (today the so-called City Cars, however shrunken, are electrified cars, ie they are vehicles that retain the negative qualities of current traffic). ► NEW GENERATION CARS, whose development will consist in the innovation of its devices in a different direction from the current one. The purpose of this (disruptive) innovation will be Car as a Service. That is: where today there is an innovation aimed at creating a Value-image for the User, there will be a trend shift that will lead to create elements of the Car able to develop a useful-value for the User (a Value-service, thanks to the smartness incorporated in the components).